Do I have to take my turn and produce a radio show? Surely not. We can't be lassoed into obligations that easily--just because some group of people decides to jointly bring about a public benefit. 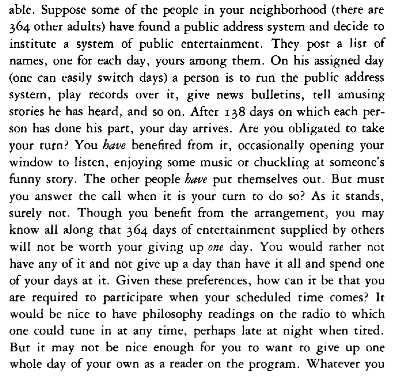 My thought is: OK, I agree with Nozick about that scenario--you don't have to produce the radio show on your appointed day. But what's going on here, and how is this different from other cases in which you are a nefarious freerider for refusing to contribute to a joint enterprise you benefit from but didn't request or initiate? Nozick seems to be posing this hypothetical in the spirit of moral realism. The answer in moral realist terms would be to say either, "Yes, devoting a day to being a DJ is an obligation because my moral realist theory says x," or "No, this is not an obligation because my moral realist theory says y." The only way to figure this out is to articulate your relevant premises and see how they react to Nozick's hypothetical. Without moral realism or an ethical theory, the question just comes down to enforcement mechanisms: will the neighborhood succeed in compelling the reluctant neighborhood member to be a DJ for a day? If there is a powerful neighborhood association, they might pull it off. (And a powerful neighborhood association might explain how they convinced the 364 other people to take their turn.) If there isn't a neighborhood association with that kind of power, then the most adamant neighbors will have have to persuade you to comply through shaming and appeals to "community spirit." So no, there's no inherent obligation. The question is whether you can be guilted into it. One way they might do this is by saying that you have an obligation to do this. This hypothetical is obviously intended to make us question the legitimacy of obligations that governments impose. Should we be obligated to fund or participate in programs that we don't agree with or care about, like war or public arts? The simple answer is: that depends on your ethical theory. If you don't have an ethical theory that addresses this, then your answer will depend on whether you think you can get away with not participating. It doesn't seem useful to mix in metaethical issues here. The issue is whether freeriding on a socially created, unrequested benefit is always wrong, or always permissible, or sometimes ok but sometimes not. We do have intuitions about cases and we have principles we can bring to bear, so there is stuff to do without ever broaching any "meta" questions about what we are doing. That's not to say we couldn't ascend to a higher level and ask what the hell we are doing when we look for an answer to questions like this. Are we discovering mind-independent truths, or discovering socially constructed truths, or what? It seems to me we can save them for another day and keep the focus (here) on freeriding. It seems clear to me that Nozick's example pumps the requisite intuitions here. We are not required contribute in this scenario. NPR actually comes close to being a real world example - there are plenty of free riders that listen to NPR but do not pay - except, in some cases, via their taxes. It's been a while since I read Nozick but if I recall correctly he DOES include "national defense" or similar constructs under things for which we MUST not be allowed to freeride. Again, if I recall correctly, this is because such constructs wind up being necessary for something like property to exist at all. A genuinely nebulous area here might be casual media piracy. How Nozick would come down on that I'm not entirely certain. I wonder if public immunization (which is what I'm really thinking about here) would be an exception like defense, and for something like the same reasons. OK, back to reading Nozick! I need to read Anarchy, State, and Utopia from cover to cover some day!